Big D's is a mystery to Google maps, all the addresses that come up are wrong, but I've been told that it started out as little more than a smokehouse with picnic tables. It served BBQ so good, it made the train stop. 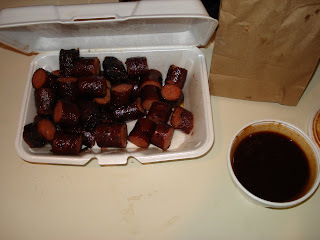 Growing up in Madison, it was always the pretty good little BBQ place on Highway 49, never too fantastic, but their sausage with a root beer on one of the picnic benches made for some pretty good memories. My mother picked up some lunch from there today and brought me back some of their sausage. First thing you notice is that is a lot of sausage for one order. 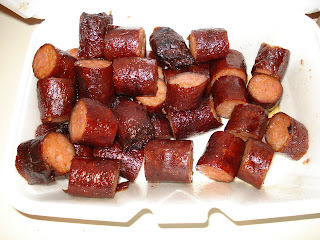 It's not that great of a pork sausage, not very much smoke flavor, no crisp snap of the casing when you take a bite. It's just a nice, mediocre BBQ sausage. You really come to expect that in Mississippi BBQ, it's not bad, it's just not great. 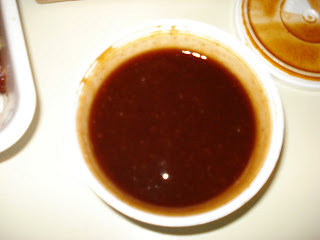 The sauce on the other hand, I think it's just some grocery store bottle like KC masterpiece that they cooked down a little.